ORLANDO, Florida - It’s the most wonderful time of the year again at SeaWorld with waves of holiday spirit, seas of trees and twinkling lights during SeaWorld Orlando’s Christmas Celebration where guests experience the joys of Christmas complete with all-new festivities and returning favorites sure to inspire traditions for years to come. Rudolph’s ChristmasTown where guests can meet Rudolph, Clarice, Bumble and Yukon Cornelius from the classic family Christmas television special, Rudolph the Red-Nosed Reindeer. Plus, guests can stroll past life-size story book vignettes showcasing the classic Rudolph story. Santa's Workshop presented by Coca-Cola – Meet Santa Claus in an all-new Christmas experience. Guests will also be entertained with special holiday shows such as Shamu Christmas Miracles, Clyde & Seamore’s Countdown to Christmas, O Wondrous Night, Elmo's Christmas Wish with Sesame Street friends, and the Winter Wonderland on Ice ice-skating performance. These holiday shows are already included with regular admission. In addition to the live performances, SeaWorld will once again display its Sea of Trees with more than 100 Christmas trees sparkling to music and lighting up the water. New this year is a glistening Christmas tree towering 70-feet above the water. 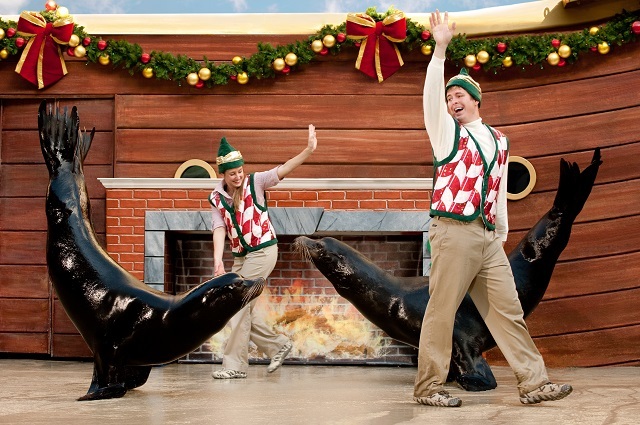 SeaWorld's Christmas celebration takes place Fridays, Saturdays and Sundays November 25 through December 11 and then run daily December 16 through 31. The best way to experience SeaWorld's Christmas Celebration and New Year’s with family and friends is with an Annual Pass. By purchasing a Pass now, guests can get three additional months free.